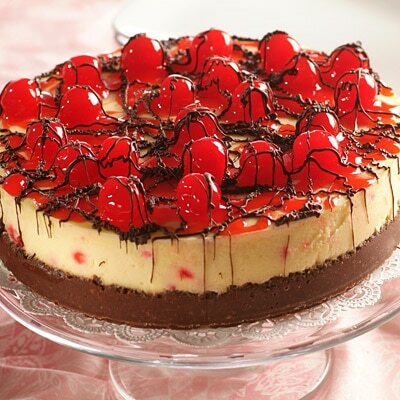 Elegant and festive, Black Forest Cheesecake is the perfect addition to your Holiday Dessert Buffet! A rich and chocolaty cream cheese filling with a layer of chopped maraschino cherries tops a delicate chocolate crumb crust. Decorated with a dazzling layer of cherry topping and drizzled chocolate, this 1st Prize winning dessert is perfect for any celebration! Created by Jeanette Spaulding of Simpsonville, KY.
PREHEAT oven to 500° F. Set roasting pan half full of water on lower rack of oven. Grease 10-inch springform pan. MELT morsels and butter in medium, uncovered microwave-safe bowl on HIGH (100%) power for 1 minute; STIR. Morsels may retain some of their shape. If, necessary, microwave at additional 10- to 15- second intervals until melted. Combine water and Nescafé in very small bowl; stir to dissolve. Add coffee, graham cracker crumbs, brown sugar and cinnamon to chocolate mixture; mix well. Press on bottom and 1 inch up side of prepared pan. BEAT cream cheese in large mixer bowl until light and fluffy. Add sugar; mix well. Add eggs, one at a time, beating well after each addition. Stir in vanilla extract. Reserve 1/3 cup batter. Pour remaining batter into prepared crust. MELT morsels in uncovered small microwave-safe bowl on HIGH(100%) power 1 minute; STIR. If necessary, microwave at additional 10- to 15-second intervals until melted. Combine water and Nescafé in very small bowl; stir to dissolve. Combine melted chocolate, reserved 1/3 cup cream cheese mixture and coffee. Stir until smooth using wire whisk. Spread mixture on top of batter. Sprinkle with 1/2 cup finely chopped cherries. Gently swirl with a thin knife. Place cheesecake on baking sheet. Bake for 10 minutes. Reduce temperature to 200° F.; bake for 1 hour or until knife inserted in the center comes out with a creamy coating. Turn off oven and let cake cool in oven for 1 1/2 hours. Remove cake from oven. Cool on wire rack for 30 minutes. Refrigerate for 2 to 3 hours or overnight. COMBINE cornstarch and reserved cherry juice in small saucepan. Cook over medium heat, stirring frequently, until thickened . Cool completely. Stir in remaining cherries. REMOVE side of springform pan. Cover top of cheesecake with cherry topping. Place morsels in small, heavy-duty plastic bag. Microwave on HIGH (100%) power for 30 seconds; knead. Microwave at additional 10- to 15-second intervals, kneading until smooth. Cut small hole in corner of bag. Squeeze to drizzle over cherry topping.